PRICE REDUCED!! 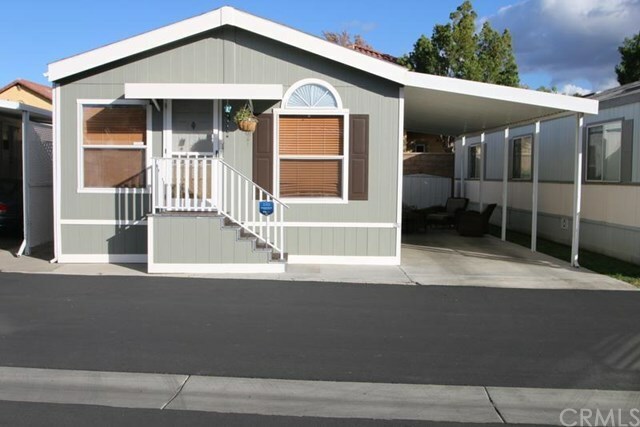 WHY PAY RENT when you can OWN this beautifully remodeled 2 bedroom 2 bath 1,022 square foot double wide Mobile home. It is situated in one of Simi Valleys most desirable mobile home parks called Tradewinds and is a top of the line Fleetwood Festival Home and is less than 10 years old. It is very spacious and has a living room and den with plenty of light, A separate dining room, Cathedral and vaulted ceilings, Central air and heat, Master bedroom has a wall to wall closet and master bath with soaking tub / shower combo and custom glass doors, A guest bedroom, Guest bathroom has glass doors on tub shower combo, Ceiling fans in bedrooms and den, Dual pane windows, Laundry inside unit, Appliances included are - washer, dryer, frig, stove and dishwasher, 2 car tandem covered parking, Enjoy the sparkling pool on those hot summer days. Close to shopping, restaurants, and 118 freeway. Family friendly park. Don't miss out on your chance to call this your home. See floor plan in pics. You won't be disappointed.